Tarnished plant bugs (Lygus lineolaris in the eastern US and L. hesperus in the western US), also known as lygus bugs, are an occasional summer pest of strawberries in North Carolina. Tarnished plant bugs overwinter as adults. In the spring, females begin laying eggs into the tissue of suitable host plants. Very young tarnished plant bugs (called nymphs) look similar to green aphids, but move more rapidly and lack cornicles (the pair of tube-like structures aphids have on their abdomens). As plant bug nymphs mature, they develop brown markings. The adult tarnished plant bugs are mottled brown and around ¼” long. The bugs use their piercing-sucking mouthparts to feed on the flowers, fruit and seed pods of many weeds and crop plants, including strawberries. Some beneficial insects such as big-eyed bugs look similar to tarnished plant bugs, so proper identification is important before taking action against them. Older tarnished plant bug nymphs have five black dots on their backs and mottled brown wing pads. The adult tarnished plant bug has two pair of wings. The outer wings are mottled brown with a yellow V-shaped marking between them and yellow triangular blotches on their tips. Tarnished plant bug feeding produces distorted or “cat-faced” fruit. This damage is due to seed feeding by nymphs or adults as fruit develop. Damaged seeds are frequently brown on the outside and hollow on the inside. Tarnished plant bug damage is rare in spring-fruiting strawberries grown in North Carolina and typically only occurs late in the season once the weather is warm. Day-neutral or everbearing strawberries may be more severely affected. Other factors, such as poor pollination, can cause misshapen fruit as well so the presence of misshapen fruit does not always indicate a problem with tarnished plant bugs. Poor pollination is often very common in the first picking of spring fruiting strawberries in the southeast, when weather is often less suitable to bee activity. Misshapen fruit due to poor pollination can readily be distinguished from those damaged by tarnished plant bugs by examining the seeds. Seeds on fruit deformed due to poor pollination will vary in size, while those on fruit damaged by tarnished plant bugs will be uniform in size. Fruit damaged by tarnished plant bug feeding. 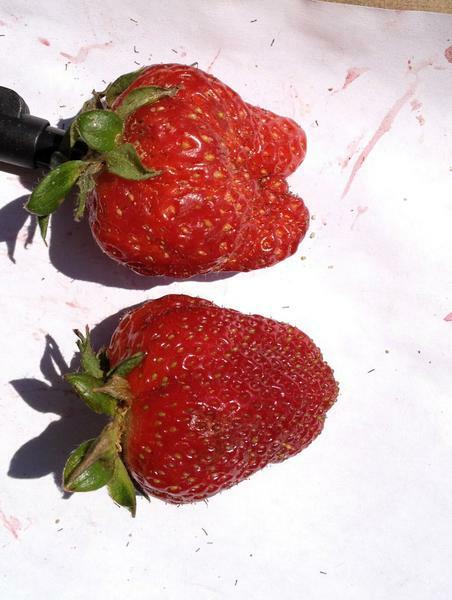 Misshapen strawberry fruit due to poor pollination (top). Note variable seed sizes compared to a normal strawberry (bottom). The easiest way to sample for tarnished plant bugs is by using a beat sheet. A beat sheet can consist of a white tray, white piece of paper on a clipboard or white fabric drawn over a 12” embroidery hoop. To sample, the beat sheet should be held below the plant and the leaves and flowers of the plant struck against the sheet with the other hand. Sample one plant every 20’. The treatment threshold for tarnished plant bugs is one bug per 20 plants. Be sure to correctly identify tarnished plant bugs and not to confuse them with beneficial big-eyed bugs. As their name suggests, big-eyed bugs have much larger eyes than tarnished plant bugs. As tarnished plant bugs feed on a wide range of weeds, good weed control reduces the likelihood of damaging populations occurring. Conventional insecticides are available for use against tarnished plant bugs. In general, insecticide treatments are more effective against nymphs than adult tarnished plant bugs. Refer to the North Carolina Agricultural Chemicals Manual for materials recommended for use against tarnished plant bugs in North Carolina and the Southern Region Small Fruit Consortium Strawberry IPM Guide for regional recommendations. Cultural methods are the only effective organically acceptable control methods at this time.